Becoming engaged is one of the most memorable moments of a person’s life. Knowing that the one you love wants to spend the rest of their life with you, is both emotionally rewarding, and sometimes overwhelming. But once the awe of the engagement passes, the excitement of the wedding planning sets in, and from there on, every day is a build up to the Big Day. Many couples know exactly what they want for their wedding, and meticulously study all the different variants on offer, be it the flower arrangements, the food, or, of course, the bride’s dress. With so many elements to plan and select, it’s easy for smaller details to be overlooked and left for the last moment, such as selecting the bride’s jewellery. By the time the wedding planning starts, the bride-to-be already has her dream engagement ring. Carefully selected by the groom to suit her taste and style, the engagement ring captures the joy experienced by the couple at the moment of the engagement. For the rest of a woman’s life, she will think back to that happy moment with every glance at her masterpiece jewellery creation. The engagement ring, however, is not the only jewellery creation that is important on your wedding day. In addition, it is important to find a wedding band that complements the engagement ring, and to determine which other pieces of jewellery are to be worn on the day. An equally important step is to select a wedding band for the groom. Though these may seem like minor details in the wake of selecting a venue, a caterer and a honeymoon destination, your wedding jewellery completes your outfit and adds the finishing touches that would otherwise be lacking. Your jewellery can make or break your overall look, which is why it is important to carefully select each piece with detailed consideration. Worn by both the bride and the groom, the wedding band is perhaps the most symbolic jewellery creation a person will ever own. Placed on the fourth finger of your left hand by your partner during the wedding ceremony, is symbolises the promise of a lifelong commitment, and an unwavering loyalty and dedication to your spouse. Many years ago, the traditional wedding band was a plain yellow gold band, with very little options of customisation. Today, there are hundreds of styles to choose from, and the wedding band can be customised to match your engagement ring. 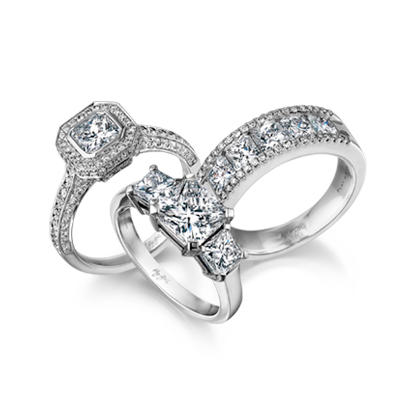 Certain engagement ring designs, such as the Shimansky Millennium Diamond Engagement Ring and the Evolym Diamond Engagement Ring require a customised matching wedding band that was designed to be worn with that particular engagement ring.In order for it to sit flush, the shape and height of the engagement ring must be taken into account, and with many shapes, only the matching wedding band will complement the engagement ring. In many cases the band is plain, but there are also options of having a wedding band with round micro-set diamonds, or to have the inside of the band engraved. The shape of your wedding band will be determined by your engagement ring, but the type of metal, the option of micro-set diamonds and the finer customisable details are entirely up to the bride-to-be’s personal taste. While men previously had very few options when selecting their wedding band, their options, today, are endless. The Shimansky Max-Line Collection features over 300 different men’s wedding band designs, made from palladium – a lightweight, hardwearing precious metal with a magnificent white metal lustre. Men are able to choose from different finishes such as matte, shiny, hammered or brushed, and can select between various styles, both including and excluding diamonds. Different fit options allow men to select a fit that sits comfortably on their finger, and that slides on and off, with ease. Though any style can be chosen, there is also the option to match your wedding band to your partner’s. Certain jewellery collections, such as the Shimansky Millennium Collection, has a men’s Millennium Asscher Diamond Wedding Band, which is a perfect complement to the women’s Millennium Engagement Rings and Wedding Bands. The most important factor, however, is the groom-to-be’s personal preference, which is always the number one priority in finding the perfect men’s wedding band. In addition to the engagement ring and wedding band, the bride also has the option of wearing earrings, a bracelet and a necklace or neckpiece. There are various things to consider when selecting the jewellery for your Big Day, and one of the most important ones, is whether the pieces you like match your dress. Though all your jewellery items certainly don’t need to be from the same collection, it is important to consider whether they all work together, and whether they complement the bridal gown. If the gown is vintage, for example, jewellery in a classic style would be a better match than bold, modern jewellery creations. If you have a dress in a colour option other than white, this should be taken into consideration, as jewellery with coloured stones may clash with the colour of the dress. Getting the balance right, means you have to be careful not to overdo it. Though it may, at first, seem like you need various jewellery creations for the day, you may find that with a detailed dress, your wedding rings and classic Shimansky Diamond Stud Earrings are sufficient. However, if you select a dress with minimal detail, you may find that a statement necklace or earrings are just what the dress needs to complete it. It is important to be comfortable at your wedding, so if you are worried about a particular jewellery creation hooking onto the fabric of your dress, or if you think the pair of earrings you had in mind might be too heavy, it is best to go with your instinct. There are enough things to worry about at a wedding – your jewellery should not be one of them. When purchasing jewellery for your wedding day, select items that you love, and would wear again. Every time you wear the earrings, bracelet or necklace you wore at your wedding, you will be reminded of how you felt on the day and you will be transported back to the special moment you are remembering. Jewellery is more than a fashion accessory; it is a symbolic creation that preserves the special moment upon which it was presented to, or worn by, its owner. Any jewellery creation is precious, but those worn on your wedding day, are even more so. Not only do they complete your outfit, but they carry symbolic significance that will stay with you for the rest of your life. Your wedding day jewellery is the jewellery you will treasure forever, the jewellery that is immortalised in your wedding photographs, and the jewellery you will pass down to your children and grandchildren. Precious symbols of the happiest moments of your life, they will be enjoyed now, and for generations to come.